Jessica Wilson spent high school and college as a student athlete, combining a grueling track-and-field training schedule with the rigors of a college prep and Ivy League education. Before earning her degree in government at Cornell, she took a gap year to train for the Canadian Olympic trials. After graduation, she spent nearly three years working on the nonprofit Plan International Canada’s “Because I Am a Girl” campaign, which advocates for education and other basic human rights for girls in developing countries. Wilson worked at Skadden after her 2L summer, relishing the opportunity to do substantive work. “Early in the summer, two female partners took me to lunch and invited me to work with them,” she recalled. “They were really invested in my success—a lot like my professors at Vanderbilt. I worked on international deals and really connected with the people at the firm.” She plans to join Skadden after graduation and hopes to work on energy and infrastructure transactions and corporate restructuring. As a 3L, Wilson is president of the Black Law Student Association in addition to her work on the Law Review. 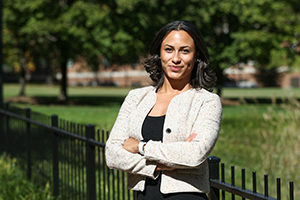 BLSA members welcomed her when she attended an Admitted Students Day, and the immediate opportunity to connect with other students of color was an important draw. “I had a gut reaction that this was the law school I was meant to attend, and the students in the Black Law Student Association were particularly influential in my decision to come to Vanderbilt,” she said. Scholarship support was also crucial. “As a Canadian, I’m not eligible for student loans,” she said. “Vanderbilt has a strong network of alumni, and they support students by endowing scholarships.” Wilson received a scholarship endowed in honor of the late Charles W. Gerdts ’78, a corporate lawyer who became the U.S.-based general counsel of PriceWaterhouse Cooper, by his classmates and friends.